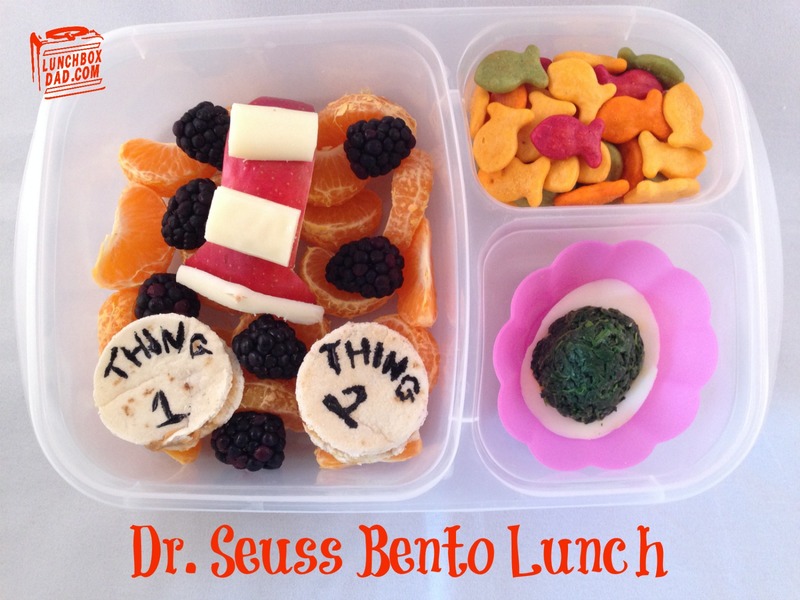 Lunchbox Dad: My Daughter and I Made a Dr. Seuss Lunch Together! My Daughter and I Made a Dr. Seuss Lunch Together! My daughter is celebrating Dr. Seuss's birthday in her class today. Yes, we know his birthday was actually March 2, but they are celebrating it today. 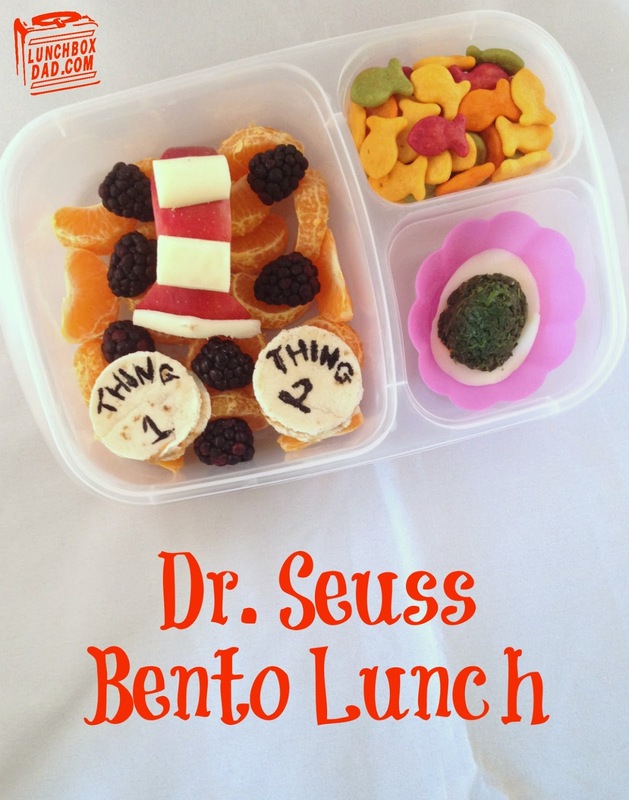 We love Dr. Seuss books in our house and my daughter made a special request for a Dr. Seuss lunch today. Usually I make the lunch and surprise her with it. For this lunch, my daughter and I made it together. Actually, my son was in on it too and we made him a special lunch as well. We decided together to do a mix of his books. Represented here is The Cat in the Hat; 1 Fish, 2 Fish, Red Fish, Blue Fish; and Green Eggs and Ham. 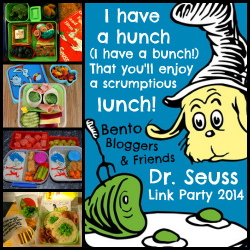 This lunch is also part of a fun Dr. Seuss blog link up with tons of great ideas for Dr. Seuss food. Check it out after you read my recipe by clicking the button below. This lunch is simple but my kids and I had a ton of fun making it together. Hopefully you will as well. It is also National Reading Month in March! Take some time today to read a Dr. Seuss book with your kids. Put away the cell phone, get down on the floor with your children, and be fully present to enjoy the story together. Trust me, you won't regret it. This was made in an Easy Lunch Boxes container and features Cutie Oranges as the background. We have been loving Cuties here, but the only problem is they don't last long in our house because they get eaten so fast! Follow me on Twitter, Facebook, and Pinterest. Also, check back tomorrow for an incredible breakfast recipe and a chance to enter your own recipe to win up to $800! 1. Peel Cuties oranges and place segments in the background of main dish. 2. Cut half of an apple in the shape of the Cat in the Hat's hat. It is fairly easy because you don't have to make it perfect, Dr. Seuss didn't make it straight! Cut three pieces off of a string cheese stick and use toothpick pieces to hold them onto the apple for the stripes. 3. Use small circular cookie cutter or glass to cut four identical circles from a pita. Spread peanut butter on two pieces and form two sandwiches. You can also use jelly if desired. 4. 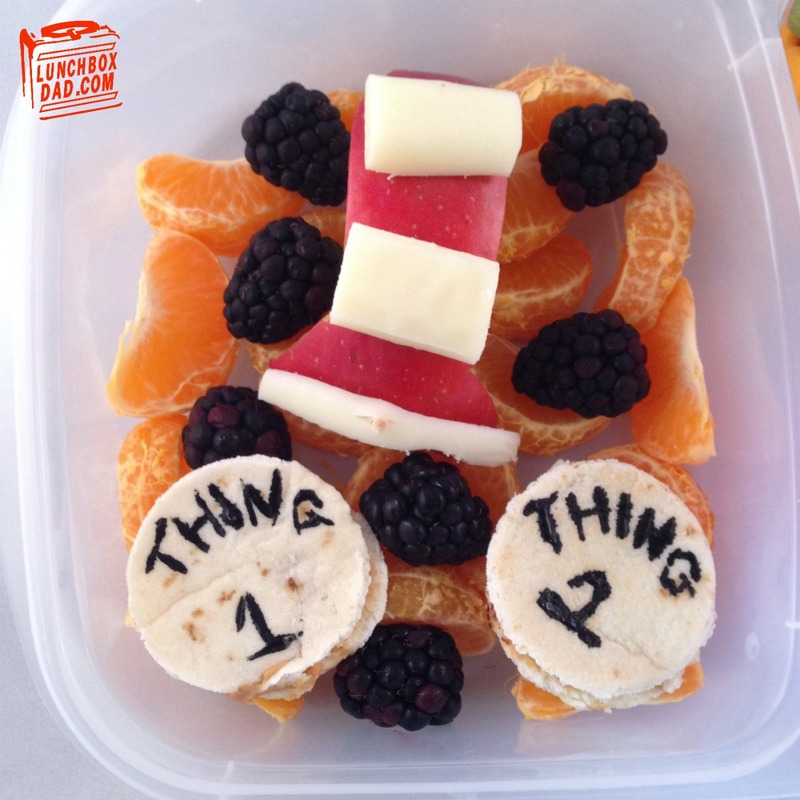 Use black food coloring and a toothpick to write "Thing 1" and Thing 2" on the top. Place sandwiches and apple hat in main container. Surround with random blackberries. 5. Heat up frozen spinach according to package directions. Take small amount and squeeze most of the moisture out. Let cool. Cut hard boiled egg in half. Take out the yolk and carefully press the spinach around it. 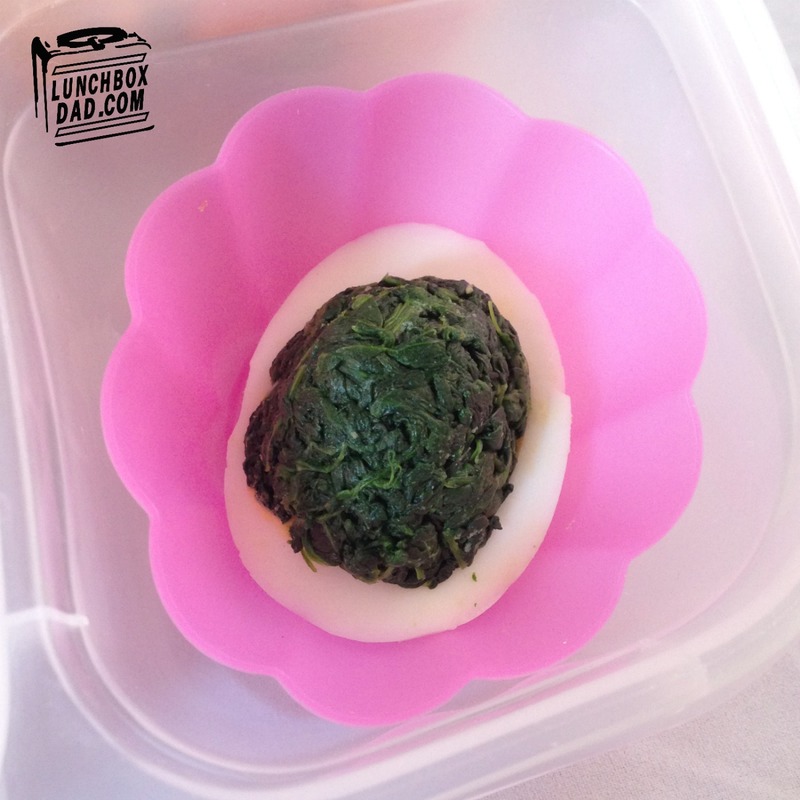 Place egg/spinach ball back in egg where yolk was. You can also use guacamole., food coloring, or just a straight spinach ball. It all depends on what your child will eat. 6. Place green egg in one side dish and goldfish shaped crackers in another one. Enjoy your lunch and a good book at the same time! Sadly we can't use peanut butter for school lunches as it's banned in almost every school in Australia because of the high rate of anaphylaxis due to peanut allergies. Other than that, I love this. Thanks! The peanut butter isn't really essential in this lunch you can use whatever you want in the small sandwiches. There is some great alternative to peanut butter. My kids also love WowButter which is nut free. There is also Sunbutter which is made from sunflower seeds. They both are great! Of course it is pretty much compulsory to use Vegemite down under. I think that will be our alternative for this one. That sounds like it would work well. I have never had Vegemite but I really need to try it some time. I wonder where I can get it here in America. I am going to look into that! Thanks so much it was really fun to make it alongside my kids! What Did You Get Done Today? Win Your Own Prize Pack of WaterWipes!